If you have ever moved you know that it is an ordeal. Recently Katherine and I moved within the same town. She is an organizational genius and our movers bragged more about her system than their own. But part of the experience involves displacement – living somewhere that isn’t really home. 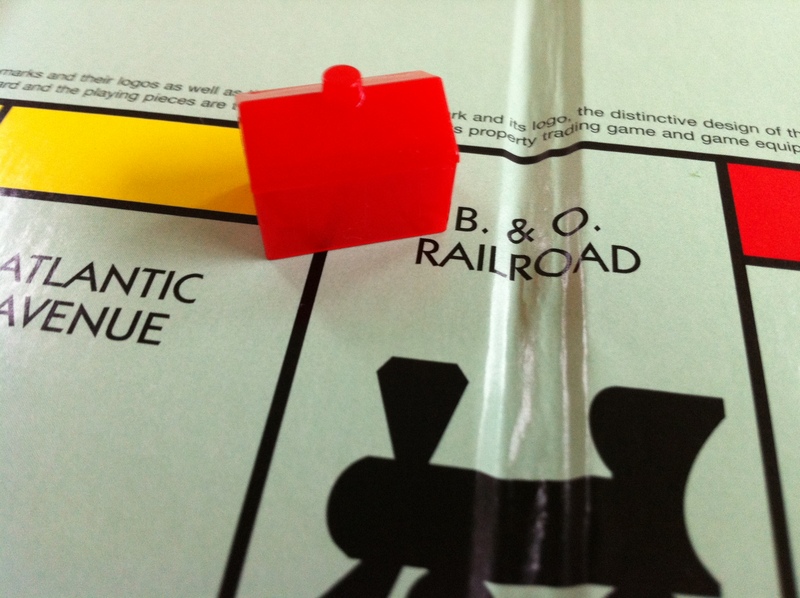 We spent two nights in a hotel (I know that Railroads don’t have hotels in Monopoly, but it wasn’t until we moved to Maryland that we learned that the ‘B&O’ in B&O Railroad stands for Baltimore & Ohio!). Once the initial relief of having someone else clean up after you wears off, living out of suitcases is no fun, even for only two days. It isn’t home. Tomorrow evening our church, and many others, will celebrate the night Jesus was betrayed. Many will follow with what we call Good Friday services in celebration of the day Jesus died. This is one of those peculiar things about Christianity that seems counterintuitive to natural thought. Most grieve death, and all feel some measure of dread when it comes. But we celebrate too. This past Sunday I shared with our congregation that Craig Bartholomew, in his book, Where Mortals Dwell, writes that our sense of ‘place’ profoundly contributes to our sense of humanness. Where we live, who we love, what we do, who we root for – everything in our daily experiences that place us in a context – all of it is part and parcel of what makes us feel human. And when some dimension of our lives is stripped away, it is a crisis to our humanness. We feel displaced. What exactly do we celebrate when we consider Jesus’ death? You have to go to the Old Testament to fully understand. Each year, on the Day of Atonement, along with the sacrifice for sin that the High Priest would offer to God on behalf of Israel, a goat was chosen to ceremonially have the sins of the people placed on its head, only to be turned loose into the wilderness, outside the camp. It was the ‘scapegoat’ that symbolically carried away the sins of the people. Do you remember when John the Baptist said, Look, the Lamb of God who takes away the sin of the world (John 2:29)? He was identifying Jesus, the true Scapegoat, the One who would be treated inhumanely, and unjustly executed, to die with our guilt upon Him displaced and outside the city of Jerusalem. Through faith it is as though we died with Jesus, only to discover that we are not displaced, but restored to the humanness we were created for. So in recognizing Jesus’ sacrifice we celebrate that in Him God has found us home. Hey, we’re unfinished, which means that in the journey, from time to time we lose sight of home. Our sin, our doubts, our fears, our crises, our affections, and a whole host of other experiences can leave us feeling less than human. But the Cross speaks into our lives with Jesus, and a glimpse of Him will do what it did for Peter when Jesus forgave him at the Sea of Galilee – it will remind us that when God looks at us, He doesn’t see failures or screw-ups. He sees His children – and they are every bit as human as His Son became for them. You are currently reading Discarded to be Human at unfinished1.